Private Water Supply Regulations Compatible! 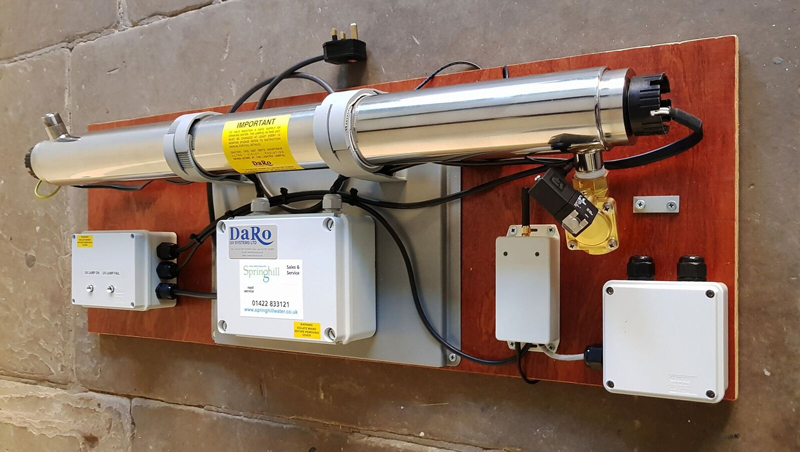 Developed by the Springhill Team with input from a major UK based UV manufacturer the UV Disinfection system Alarm system is a UV upgrade that meets the requirement for UV disinfection to fail to safe, sounding an alarm at the same time. Available in a variety of configurations, the alarm system informs the householder (or nominated person) should the UV stop working. The UV Disinfection Alarm can be used to upgrade existing equipment or it can be supplied as a complete UV disinfection system. The image shows a UV with alarm, solenoid shut off valve & text messaging facility.